If you are a true meat lover, then you understand the different nuances in the cut of meat and how it is prepared. One beef sandwich is not the same as the next, especially when it comes to barbecue. 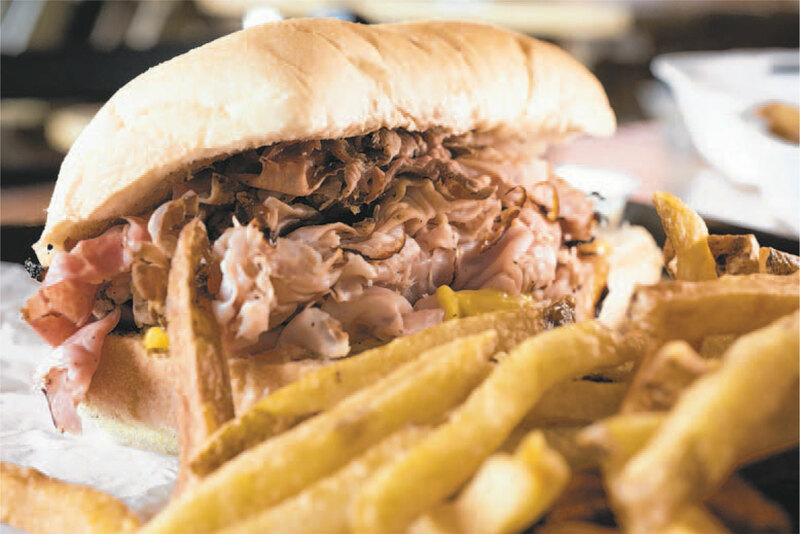 Have you ever wondered what makes Chaps Pit Beef different than other beef sandwiches? Anyone can buy a bottom round piece of beef, but not everyone knows how to transform it into a tasty sandwich. It is the cooking style and the Chaps special proprietary spice rub that makes Chaps Pit Beef sandwiches impossible to duplicate. All meats are cooked over a solid fuel charcoal flame kept burning in a custom pit until they are the right tenderness with the perfect hint of char. Another thing that makes Chaps Pit Beef’s cooking style so special is that all the dishes are made from scratch with the freshest ingredients. Besides its special proprietary spice rub, Chaps also puts its own personal twist on every day food items making their signature dishes impossible to replicate. The type of barbecue they offer at Chaps Pit Beef is also a real people pleaser and a Baltimore specialty. Baltimore Pit Beef is basically barbecued beef that is crusty on the outside and juicy and almost rare on the inside. The meat is shaved into thin strips and heaped high on a sandwich. People come far and wide to get a taste of this unique style of pit beef. What else makes this such a signature Baltimore dish is the sauce. Unlike other regions which use a mix of ketchup, brown sugar or vinegar to give the meat its flavor, the sauce used with Baltimore pit beef has horseradish sauce in it which keeps the customers coming back for more. And Chaps Pit Beef, of course, adds its own unique ingredients to make their special sauce stand out among the competition. The pit beef served by Chaps Pit Beef comes out on either a kaiser roll or rye bread to give an earthy flavor to the sandwich that you can’t get anywhere else. The bread can make or break a sandwich, right? Chaps Pit Beef has been growing by leaps and bounds. Did you know that they are in the process of expanding their franchise program? 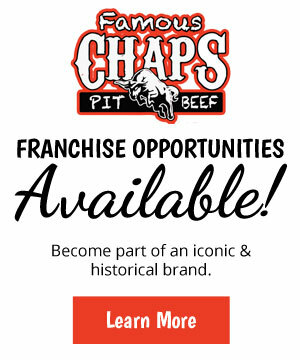 If you love Chaps Pit Beef and their mouthwatering dishes and have always wanted to run your own BBQ restaurant, consider franchising with Chaps Pit Beef. 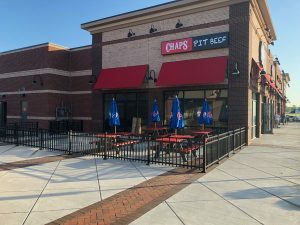 Chaps Pit Beef is one of the best money making franchise opportunities out there. From a BBQ recipe that makes customers’ mouths water to supportive franchisors who want to help you succeed, you can’t go wrong with Chaps Pit Beef. When you learn Chaps Pit Beef’s origin story, you get a true sense of the hardworking family behind the success of this franchise restaurant and how they treat all their staff and customers as family. While they have expanded and have many more staff and customers than when they first started out, the Creagers still make sure that everyone still feels like family. With locations in Baltimore on Pulaski Highway and in Aberdeen on Beards Hill Road, the Creagers have created a strong following of patrons and restaurant critics alike. People come far and wide for their original pit beef sandwich and other specialty sandwiches. There is already a strong customer base so you won’t have to build it from the ground up like you would have to do if you were starting your own original business. What really makes Chaps Pit Beef franchise program so special though is that they offer a strong support structure for their franchisees, giving them all the training and resources they will need to run their own successful Chaps unit. The Creagers want their business to flourish so they take seriously the idea of growing new talent. They want you to succeed and will give you the tools to make it happen. This is especially attractive if you are new to owning your business. Overall, if you are looking to get into the franchise business, Chaps Pit Beef is a smart choice. Barbecue will never go out of style and barbecue franchises are really popular now. For more information about franchising with Chaps Pit Beef and what makes their signature dishes so special, call them today.